Charles Henry Bibby (born November 24, 1949) is a former professional basketball player. His brother, Jim Bibby, was a Major League Baseball pitcher, and his son, Mike Bibby, is a retired point guard of the National Basketball Association. Bibby was a starting point guard as the UCLA Bruins won three straight NCAA Men's Division I Basketball Championships in 1970, 1971 and 1972 under head coach John Wooden. 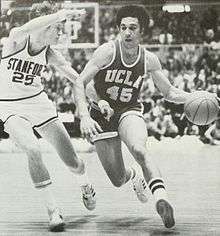 Bibby helped lead the Bruins through the first 47 games of an 88-game winning streak and was named an All-American his senior year. He was one of only 4 players to have started on 3 NCAA championship teams; the others all played for Wooden at UCLA: Lew Alcindor, Curtis Rowe and Lynn Shackelford. In the 1972 NBA draft, Bibby was drafted in the fourth round by the New York Knicks and in the second round of the 1972 ABA Draft by the Carolina Cougars. Bibby opted to play for the Knicks and was with the team for two-and-a-half seasons, which included an NBA title in 1973. Bibby spent nine seasons in the NBA, and was a part of the 1977 and 1980 Philadelphia 76ers teams that made the NBA Finals but lost both times. Bibby started his coaching career in the Continental Basketball Association (CBA) and won two championships in 1982 and 1989. He coached the Winnipeg Thunder. In 1996, he was named coach of the men's basketball team at the University of Southern California (USC), and kept that position for nine seasons. Bibby had an overall won-loss record of 131-111 at USC. He led his 1997, 2001 and 2002 teams to the NCAA tournament, including an "Elite Eight" appearance in 2001. He was fired four games into his ninth season. In April 2005, he was named head coach of the Los Angeles Sparks of the Women's National Basketball Association (WNBA). After 28 games, he was replaced by his assistant coach, Joe Bryant. On January 17, 2006, Bibby was hired by the Philadelphia 76ers as an assistant coach on Maurice Cheeks' staff and remained there until the end of the 2007–2008 season, when his contract was not renewed. In February 2009 he was hired by the Memphis Grizzlies as an assistant coach. He remained with the team until 2013, when he joined the Detroit Pistons' coaching staff. Bibby is the brother of Jim Bibby, a former Major League Baseball pitcher, and father of Mike Bibby, who played in the NBA. Henry Bibby and son Mike are one of four father-son duos to each win an NCAA basketball championship. [note 1] Henry and Mike were initially estranged after Henry divorced from Mike's mother, leading Mike to publicly state "My father is not part of my life" after winning the NCAA title in 1997, but they later reconnected starting in 2002 as Mike was reaching his peak in the NBA. ↑ "Nolan Smith and Kyle Singler and a Crystal Ball Oliver Purnell Pursuing Greener Pastures Roy Halladay Deal Good for Baseball?". ESPN.com. April 6, 2010. Archived from the original on January 23, 2014.